Our T.D. Smith Transport family and staff has made a $300,000 donation, out of a total contribution of $500,000, to redevelop the emergency and ambulatory departments at Mount Forest's Louise Marshall Hospital. The reconstruction of the emergency department is expected to accommodate growth in emergency visits, which are expected to increase to over 1,050 patients per month by 2018. 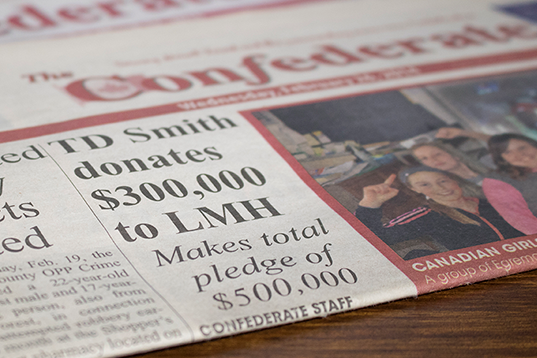 Mike Smith says about the donation "We feel blessed to live in a community where everybody acknowledges the importance of our hospital and the great lengths everybody commits, in one way or another, to ensure industry stays viable in Mount Forest."